The Palace of Versailles, France. The Palace of Versailles (built c.1624-98), a magnificent example of French Baroque architecture, is the most famous royal chateau in France. The gigantic scale of Versailles exemplifies the architectural theme of 'creation by division' - a series of simple repetitions rhythmically marked off by the repetition of the large windows - which expresses the fundamental values of Baroque art and in which the focal point of the interior, as well as of the entire building, is the king's bed. Among its celebrated architectural designs is the Hall of Mirrors (Galerie des Glaces), which is one of the most famous rooms in the world. Located some 20 kilometres southwest of Paris, and set amidst extensive grounds, the palace and its decoration stimulated a mini-renaissance of interior design, as well as decorative art, during the 17th and 18th centuries. Indeed, French decorative art during the period 1640-1792 - notably French Furniture - is synonymous with the French Kings Louis Quatorze (XIV), Louis Quinze (XV) and Louis Seize (XVI), after whom it is named. The many French designers and craftsmen who contributed to Versailles' architecture, furnishings and objets d'art, included Louis Le Vau, Jules Hardouin Mansart, Andre le Notre, Charles Le Brun, Jean Berain the Elder, Andre-Charles Boulle, Charles Cressent, Jean-Baptiste Oudry, Francois Lemoyne, and Juste-Aurele Meissonnier, among others. From 1682 to the beginning of the French Revolution in 1789, the Palace of Versailles housed the King and the entire French royal court, a total of some 3,000 residents, making it a symbol of the absolutism and decadence of the Ancien Regime in general, and the French monarchy in particular. The royal chateau itself is not the only building complex in the grounds, which also include five chapels, plus the Grand Trianon (1687-88), the Pavilion Francais (1749), and the Petit Trianon (1762-8) as well as 800 hectares of gardens, landscaped in the classic French Garden style. In 1624 - following in the footsteps of Francis I (reigned 1515-47) who converted a medieval hunting lodge into a magnificent chateau, establishing the Fontainebleau School in the process - King Louis XIII (reigned 1610-43) ordered the building of a hunting lodge on land near the village of Versailles. This took the form of a small structure, designed by Philibert Le Roy, made of stone and red brick. In 1632, the first enlargements were made, however, it wasn't until the reign of Louis XIV that the lodge was transformed into one of the largest palaces in the world. To begin with (c.1661), Baroque architects under the direction of chief designer Louis Le Vau (1612-70), the garden designer Andre le Notre (1613-1700) and arts supremo Charles Le Brun (1619-90), converted the stone and brick lodge into a 3-storey chateau complete with an impressive black-and-white marble courtyard, complete with columns and wrought-iron balconies. It was given a flat roof and two new wings, containing apartments for the king and queen, and was known as Marble Court. Thereafter, in a series of four main building campaigns - stage one (16641668), stage two (16691672); stage three (16781684) and stage four (16991710) - the chateau was enveloped in a new and larger palatial complex, under the supervision of architect Jules Hardouin Mansart (1646-1708), great-nephew of the famous royal architect Francois Mansart (1598-1666), inventor of the widely used 'mansard roof'. This expansion was designed to give effect to Louis XIV's decision to rehouse the entire royal court at Versailles (which duly occurred in 1682), in order to exercise greater control over his nobles, and distance the government from the Paris mob. By centralizing all government offices at the Palace, and by obliging his nobles to spend a set amount of time there, his aim was to create an all-powerful, absolute monarchy. A court of 3,000 residents, including the king and queen, members of the royal family, government ministers, aristocrats, diplomats, civil servants and the like, required a suitably grand building, and no expense was spared. Indeed, the new complex became the apogee of palace architecture. Surrounded by 800 hectares of immaculate gardens, with beautiful vistas, fountains and statues, the palace contained several symmetrical suites of apartments for the public and private use of the king and queen, as well as numerous other architectural highlights. These included The Hall of Mirrors (1678-90) - the central gallery of the Palace - which comprised 17 mirror-clad arches reflecting the 17 windows. A total of 357 mirrors were used in its decoration. The ornamentations - the canvases along the ceiling that celebrate the apotheosis of the king, the polychrome marbles, the gilt bronzes -were organized by Le Brun, and in this undertaking he can be said to have reached the peak of the expressive possibilities of French Baroque art. Another famous room is the Royal Opera of Versailles, designed by Ange-Jacques Gabriel (1698-82), which can seat up to 1200 guests. It was one of the earliest expressions of the Louis XVI style. Other important reception rooms, included: the Salons of Hercules, Diane, Mars, Mercury, Apollo, Jupiter, Saturn and Venus, all named after Roman gods and goddesses. The rooms were decorated with mural painting, much of it by Le Brun, who was strongly influenced by the Italian tradition of architectural Baroque painting, as exemplified by the quadratura illusionism of Pietro da Cortona (1596-1669) at the Pitti Palace in Florence. Additional building works as well as alterations to the gardens, were instigated by both Louis XV and Louis XVI, but no major changes took place. The Palace of Versailles's interior designwork and decoration was legendary in its range, quality and expense. It featured the finest furniture and furnishings, beautiful ceramic art including Sevres porcelain, as well as tapestry art and small-scale bronze sculpture. The initial salons and the Hall of Mirrors even contained lavish displays of silver table pieces, gueridons and other furniture, though these were later melted down to finance further military campaigns. Not surprisingly, Louis XIV's astronomical expenditure stimulated a huge expansion of French crafts and specialist applied art, led directly to the emergence of Rococo art (dominated by France), and created an impetus in French painting and sculpture that paved the way for Paris to become the arts capital of the world. The royal palace's close relationship to its park was of fundamental importance, for the park, exactly like the palace itself, was made to serve the ceremonial and celebratory requirements of the king. Designed for the amusements of the court, the park constitutes the natural and ideal backdrop for endless festivities based on the close relationship - typical of the baroque - between celebration and architecture, between the ephemeral and the permanent. From the original concept, the palace was seen as the centre of an urbanistic system and a reworking of the landscape. Such were the aesthetics and the goal of Andre Le Notre, inventor of the 'French' garden, who began work at Versailles in 1662. Although it maintains the symmetry of Italian tradition, the park of Versailles has a network of axial pathways leading off to the horizon. These paths are cadenced by rond-points, pavilions, arboreal architecture, wider areas that suddenly appear ahead, stairways, terraces, ponds, and monumental fountains that expand the visual perception of space and add a sense of wonder. The gardens at Versailles contain several different types of statue, including works by sculptors like: Francois Girardon (Apollo Tended by Nymphs of Thetis); Jean Baptiste Tuby (Fountain of Apollo); Antoine Coysevox (portraits of Louis XIV and Le Brun); Gaspard Marsy (Fountain of Bacchus or the "Island of Autumn"); among others. Versailles was not created merely to serve as a refuge and place of amusement: its innovative organization of space was also meant to be symbolic of the new order of the state. The park's arrangement and its iconographic themes interpret the symbolic meaning of royal order in the world. The Palace of Versailles continued to influence late-18th century architecture and beyond, although first it had to survive the iconoclasm of the French Revolution. In all the arts, the age of Louis XIV was marked by brilliance and splendour. Art was organized by the State for the purpose of increasing the glory of France through the figure of Louis, the Sun King, and the decoration of his private and public buildings. Although such close control of art often results in staleness, official French art of the second half of the seventeenth century is characterized by supreme grandeur and self-confidence. Ever since the invasion of Italy by Charles VIII in 1494, France had wished to imitate the art of the Italian Renaissance, and the influence of Italians was tremendous throughout the sixteenth century. The palace of Fontainebleau, for instance, was decorated by Italians like Francesco Primaticcio (1504-70), Rosso Fiorentino (1494-1540) and Benvenuto Cellini (1500-71) from 1530 onwards, and Italian architects provided designs which greatly influenced native architects. Gradually, from about 1560, France developed a school of architects of her own, but in painting and sculpture foreign artists continued to be used until well into the seventeenth century. French artists tended to go to Italy to be trained and several chose to remain there throughout their careers, including Claude Lorrain (1600-82) and Nicholas Poussin (1594-1665), now considered the greatest French artists of the age. In 1627, the painter Simon Vouet (1590-1649) returned to France from Italy, bringing with him a simplified and less extravagant version of the Italian Baroque style. He trained the artists of the next generation, including Eustache LeSueur (1616-55) and Charles LeBrun (1619-90). LeBrun became virtual dictator of official art under Louis XIV, his work reflecting the pomp and formality of court life. Poussin had met with less success; his visit to Paris in 1640-42 to work for the Crown was an unhappy one, because his austere and thoughtful small-scale paintings could not rival the fashion for Baroque. By this time Poussin had turned to Christian and classical subjects, in which he explored the nature of human emotion in clear, simple compositions. His belief was that painting should aim to reveal universal truths about Life and Mankind. In his style and philosophical outlook, this artist can be compared with the two great tragic dramatists of the period, Pierre Corneille (1606-84) and Jean Racine (1639-99). Louis XIV came to the throne in 1643 at the age of four. His chief minister was at first Mazarin, but at his death in 1661 Louis virtually took over the government of the country himself. Louis is the supreme example of the absolute monarch: his conviction of his divine authority was symbolized in his sun emblem, seen everywhere in the decoration of his palace at Versailles. His reign saw France preeminent in Europe; its political power and artistic sophistication was reflected in the court which Louis conducted with rigid formality and ceremony. A few powerful ministers were retained by Louis, among them Colbert, who was responsible for organizing the arts. During this period France was blessed with academies of architecture, music, inscriptions and dance. The Academy of Painting and Sculpture, founded in 1648, came under the control of Colbert in 1661: he increased its power and made it more exclusive. The idea of the academy was Italian, and took over from the medieval guild-system, with its period of apprenticeship leading up to the production of a 'masterpiece', after which the apprentice became a full member. Colbert established a similar system. Artists were taught the 'official' style; if they followed it in their own work, they were selected for employment by the State, whether as painters, sculptors, jewellers or joiners. The 'approved' style of painting during the age of Louis XIV was a modified version of Italian Baroque. Architecture revealed the same influences, seen at work in the scheme to reconstruct the Louvre, the Paris seat of the French kings. The conversion of the building from a medieval castle into a modern palace progressed slowly from 1546 until its completion in 1674 by a team of designers: LeBrun, LeVau and Perrault. Colbert, in his position as Director of Buildings, invited plans for the East Front from leading French architects. Those which were submitted were rejected on various grounds and, finally, plans were sought from the great Bernini (1598-1680), the master of the Italian Baroque. In all, Bernini submitted three designs, which were each judged to be out of character with the rest of the building. Bernini's visit to Paris, where he roused the anger of French artists and architects by his low opinion of their work, led to his third and final design being rejected - and with it the full extravagance of Italian Baroque. The East Front as erected still owed something to his plans, being restrained yet festive, but it complements the earlier sections of the building, rather than belittling them, as all Bernini's designs tended to do. Members of the same team were employed in the most ambitious architectural scheme of the age - the remodelling of Versailles. Versailles began life as a hunting lodge of very moderate size, the king's private refuge, but was reincarnated as a palace in 1661 to house the entire French court. Its first architect was Louis LeVau (1612-70), who apart from collaborating on the Louvre had designed the great chateau of Vaux-le Vicomte for Fouquet, Louis' Minister of Finance. LeBrun as decorator and LeNotre, a garden designer, had also worked on the chateau. When Fouquet was jailed for embezzlement in 1661 the entire team was re-employed at Versailles. Today, we can only appreciate LeVau's remodelling of Versailles through prints, for his work was destroyed (from 1678 onwards) by Jules-Hardouin Mansart, who was commissioned to extend the garden front of the building to a length of 402 metres (1,319 ft). On such a scale as this the grandeur verges on monotony. Mansart's most famous contribution to the interior of the palace is the Hall of Mirrors (1678-84). The mirrors - an expensive commodity used to extravagant profusion - are interspersed by pilasters of green marble; gilded trophies sit on the richly decorated cornice (the projecting ornamental moulding along the top of a wall) and the vaulted ceiling is decorated with paintings by LeBrun. The same qualities of immense scale, colour, richness, as well as the use of expensive materials are to be seen in the park, where LeNotre was aided by armies of contractors and labourers. Water and fountains (with complicated pumping mechanisms), radiating avenues and parterres (ornamental patterns of flower beds) are all important features in the total effect of order and formality. In the plan of the scheme as a whole, the authority of the palace seems to radiate outwards to control its surroundings. In the use of Baroque planning principles which this scheme reveals, France discovered a way of expressing her European supremacy. The furnishing of rooms as numerous and large as those created in palaces like Versailles required a definite organization of the decorative arts. Again, it was Colbert who provided the answer. In 1667 he created the Crown Furniture Works at Gobelins just as, three years previously, he had given the factory at Beauvais the title of Royal Tapestry Works. The Gobelin family business, founded 200 years before, had in 1662 been taken over for the Crown by Colbert, who declared that henceforth art would serve the King. The factory at Gobelins, with Charles LeBrun as its artistic director, was to give a home to "..painters, master-weavers of high-warp tapestry, founders, engravers, gem-cutters, joiners in oak and other woods, dyers, and other skilled workers in all sorts of arts and crafts.."
The furniture produced during this period was heavy (although rarely as heavy as the suite of solid silver made for the King's study - soon melted down to help military expenses). Marquetry (inlaid work of various coloured woods) and applied decorations in gilt bronze were particularly prized. Curves and scrolls, allegorical and antique motifs were often used. The walls would often be hung with tapestries, which took much longer to make than paintings of similar size, and which might be enriched by gold and silver threads. Carpets woven at Aubusson or Savonnerie would decorate the floors of the palaces. A style of such magnificence could not survive either the decline in France's fortunes or the death of the Sun King in 1715. The pomp of this age was succeeded by the lightness and pastel gaiety of the eighteenth century. In architecture and the decorative arts as in painting and sculpture the new style, known as Rococo, would rule until challenged by Neoclassical aethetics after the mid-century. During this period, during which an enormous amount of French artworks and objets d'art were looted and desecrated, the Palace of Versailles suffered its own share of vandalism and theft. Eventually the government of the Republic decreed it should become a repository of valuable artworks confiscated from the monarchy, and a museum was established at the Palace, only to be closed and its works dispersed not long afterwards. It wasn't until the appointment of Pierre de Nolhac as curator of the Palace of Versailles in 1892, that attempts were made to restore the palace to something approaching its condition before the Revolution. However, no comprehensive repair and conservation work was completed until the 1950s, when Gerald van der Kemp was appointed chief conservator (1952-80). Today, the Palace of Versailles is an international tourist attraction and a major monument of French culture during the Ancien Regime. Of the many French designers who contributed to the Palace of Versailles, the leading figures included Louis Le Vau, Jules Hardouin Mansart, and Charles Le Brun. First architect to King Louis XIV and superintendent of royal constructions, Louis Le Vau performed an important role in the evolution of 17th-century French architecture. His training period included an important trip to Italy with visits to Genoa and Rome; in 1650 he began working for the French crown, building the pavilions of the king and queen at Vincennes, enlarging the church of St Sulpice, and participating in the completion of the Louvre. One of his major works was the chateau of Vaux-le-Vicomte, constructed in only five years (1656-61) for the finance minister Nicolas Fouquet. He then began work on the royal palace of Versailles, where he designed an enlargement of the original structure built in 1623 for Louis XIII, working together with Le Brun and Le Notre, who had worked with him at Vaux-le-Vicomte. Le Vau was responsible for the central nucleus of the palace, the two wings of the courtyard, the cour d'honneur, where the roads from Paris converge, the garden facade, and the unusual adoption of the flat 'Italian-style' roof, perhaps derived from Bernini's proposed plan for the Louvre. In addition, he was responsible for the earliest major scheme of chinoiserie decoration in interior design - which appears in the Trianon de Porcelaine (1670). 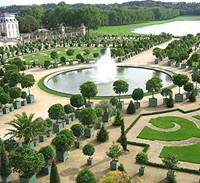 The selection of Le Vau, who had already made the revolutionary chateau of Vaux-le-Vicomte, reveals the desire for a structure with close ties to the surrounding nature as in the concept of 'between court and garden', exemplified by the planning of an axial system and the arrangement of the park. Great-nephew of Francois Mansart, Louis XIII's famous architect, with whom a new classical period began in France, Jules Hardouin Mansart was the favourite of Louis XIV, who named him superintendent of royal constructions. He had been a pupil of his uncle, from whom he derived the sobriety of external decoration and the correctness of proportions. His major work was the royal palace at Versailles, in which he brought to conclusion the design by Le Vau to rework the small existing structure and to enlarge the palace with later structures, including most especially the Galerie des Glaces, the Grand Trianon, and the chapel. Architect and urban planner, Mansart designed Place Vendome, formerly Place Louis-le-Grand, but his greatest work was the Dome des Invalides, a church with a Greek-cross layout crowned by a dome connected to the facade, in which he did away with excesses of decoration, preferring combinations of volumes and lines. The leading artist-politician of the 17th century, Charles Le Brun was a pupil of Simon Vouet before gaining the patronage of Cardinal Richelieu in 1641. He became the founder and director of the French Academy, after which he supervised the decorations for Vaux-le-Vicomte, for Minister Fouquet. After Fouquet's fall, Le Brun's talents were recognized by the powerful Jean-Baptiste Colbert (16191683), finance minister to Louis XIV, who made him director of the Gobelins tapestry factory and chief painter to the king. Appointed a sort of creative overseer at the Palace, Le Brun had direct responsibility for painting the Hall of Mirrors, as well as the Salons de la Guerre and de la Paix. The first great garden architect, Le Notre was the creator of the so-called French garden, characterized by axial arrangements leading to unbroken vistas with the space of the garden defined by parterres of flowers and hedges, bodies of water, canals, and fountains. His most famous works are the park of the royal Palace of Versailles (begun 1661), that of Vaux-le-Vicomte (1655-61) and that of the chateau of Chantilly.  For the chronology of French interior design during the reign of Louis XIV, see: History of Art Timeline.  For information about painting in France, see: Homepage.